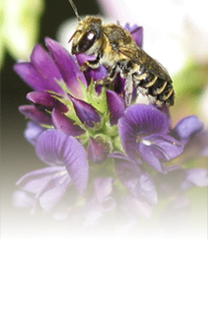 Ricard Farms Ltd. is located in Estevan, SK, and is proud to be in operation since 1993 with the production of Alfalfa Seed and Leafcutter Bee Larva. Over the years we have built and maintained strong relationships with all of our customers! To improve on our business activities and add to the diversity of our success we have included the retailing of grass seed and grass seed mixtures to our customers in Saskatchewan. Bee Brokerage has also added to the diversity of our farming operations in an effort to meet the demands of the current US market for the purchase of Leafcutter Bee Larva with customers satisfied in Utah, Idaho and Washington states. Our Mission: Ricard Farms Ltd. is committed to our customer satisfaction by producing both quality products and offering Bee Brokerage services in both Canada and the United States. With the success of our Alfalfa seed sales and in an effort to diversify our business interests, Ricard Farms has expanded its product base to offer a wide variety of quality grass seeds and grass seed mixtures to its customer in Saskatchewan. Customer satisfaction is Ricard Farms long term objective and by offering quality alfalfa seed and grass seeds to our current and future customers, this will meet the growing market demand as well as enhancing customer satisfaction with a variety of products readily available. Our bee brokerage division of Ricard Farms boasts high quality “Saskatchewan born and raised” leafcutter bees which enables us to meet growing market demand within the United States. Currently our customer base reaches into Utah, Idaho and Washington and beyond. We not only offer a quality product but delivery is also offered at affordable rates to our customers south of the border. In recent years the bee production and marketing of bees to the United States has grown significantly, with our customer base expanding yearly the brokering of leafcutter bees has become an intricate part of the yearly business activities.